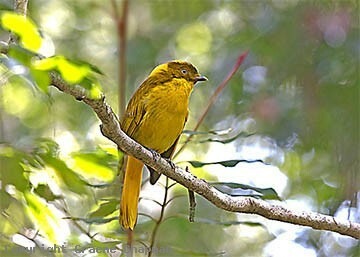 Golden Bowerbirds are the smallest bowerbird in Australia and one of the most sought-after here by birdwatchers. Deep in the highland rainforests of NE Queensland they occupy home ranges of seven hectares or so. The best chance of observing the beautiful male is to locate one of their distinctive maypole type bowers which are maintained in much the same place for years on end. With such a large area of rainforest to search finding bowers is no easy task - wandering around away from tracks in such mountainous terrain you are at great risk of becoming lost. Displaying males do utter a distinctive ringing song (listen on sound page) that carries a long way through the rainforest and is tempting to follow up - finding your way back is the trick! Fortunately, the location of quite a few bowers is well known amongst the birding fraternity, so this is the best way to go. 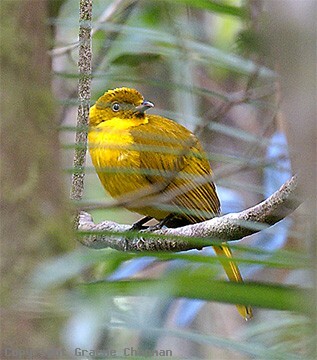 The life history of the Golden Bowerbird is very well-known and an excellent summary may be found in the book "Bowerbirds" (ISBN 97818764 3631) by Clifford and Dawn Frith. They studied Golden Bowerbirds for many years, best exemplified by the fact that they had records of individual males at least 23 years old! Immature males remain in female-like plumage (which is fairly plain brown) for at least five to six years before attaining their golden garb and maintaining a permanent bower which may be kept for up to 20 years. 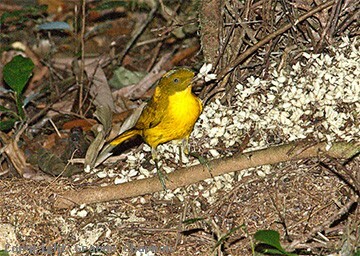 Golden Bowerbirds are predominantly fruit eaters but the diet includes caterpillars, termites, other insects and spiders. Males are promiscuous and may mate with several females in a season. They are the only maypole builder in Australia and their large bowers are quite unlike the parallel stick avenue bowers of our more familiar bowerbirds. 685201-D ... Golden Bowerbird, male. 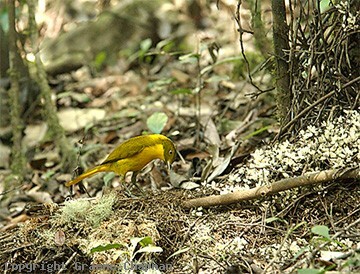 685202-D ... Golden Bowerbird male at bower. 685206-D ... Watching me through his "window".